In the quad you get 2 shimmery shades (light champagne and mid-toned brown), and 2 matte shades (dark brown and darkest brown/black). 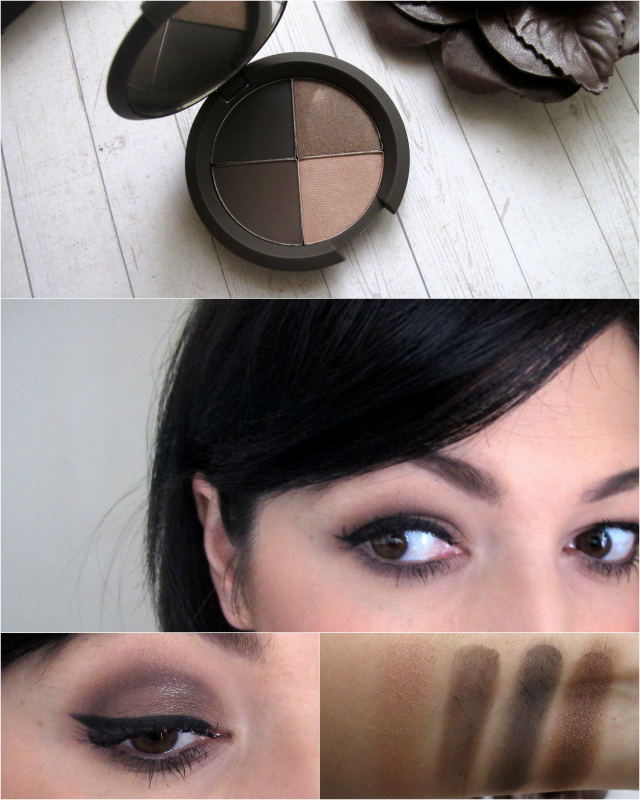 All 4 shades work beautifully together, and you can even use the matte shades on your brows. I've never tried Becca eyeshadows, so I'm quite impressed by the formula of these. They are all highly pigmented, though the matte shades are slightly powdery but there's no fall out. What I love about them is they don't run into each other when you apply them and create a murky all over brown shade, you actually still get the beautiful delineation of the different colours. My favourite way to use it is to wear the mid-brown shimmery shade all over my lid, the dark brown in the crease blended with the champagne, and sometimes I'll wear the darkest brown on the lash line instead of liner. Have you tried Becca eyeshadows? Or anything from Becca for that matter? It's a brand that's always been on my radar but I haven't really tried many things from them. Must remedy that. Becca annoys me! There's never anyone at the counter to help and they're an Australian brand yet the prices seem higher here and they don't have all the same products available to us. I really want to try their lowlight, highlight palette but it's not available here. Oh I know what you mean about there not being anyone to help! I know only a few stockists and none of them seem to have staff to help out. On the plus side, it does give me a chance to browse without being hassled but I've never actually bought anything because there's no one there to ask! You do a really lovely eye look. follower, love it if you followed me.